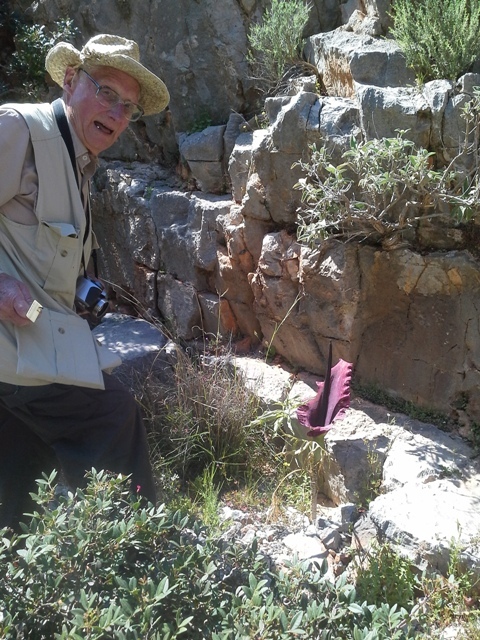 In April I was in Western Crete in the company of a group of botanical enthusiasts. One of the most truly memorable plants, ( not rare, but spectacular) was Dracunculus vulgaris var. 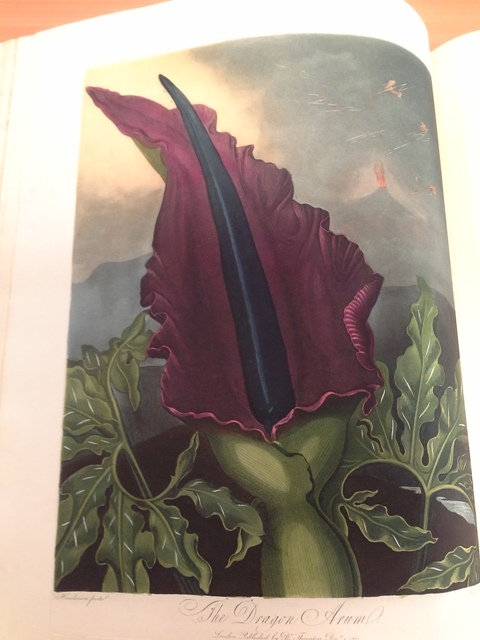 creticus The Dragon Arum. 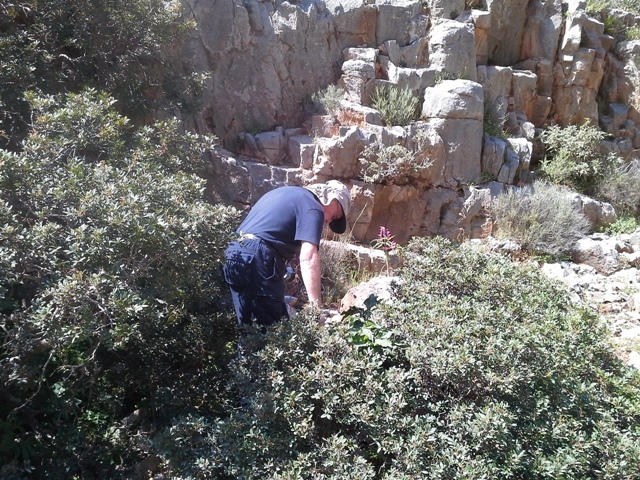 I photographed it repeatedly in the scrubby roadside on the Akrotiri peninsula. As with meeting a group of giraffes on safari, each individual you see seems more unique and and exquisite than the last. 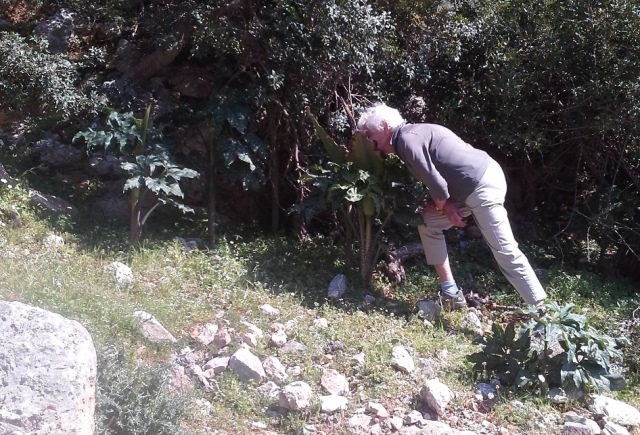 We were all of us equally enthused, exploring among the scrub on the stoney slopes, brandishing i-phones, tablets and cameras, getting in close to verify the alleged powerful and disgusting odour of the flower. The stem is thick, fleshy, pale, and sinisterly mottled in purple blotches, and rises up to a metre from the poor earth. The luxuriant leaves are deeply cut into leaflets and mottled in white, while the chocolate-purple coloured spadix extends from the silky purple enfolding spathe. Certainly a plant which evokes a sense of drama – a Little Shop of Horrors sort of plant. 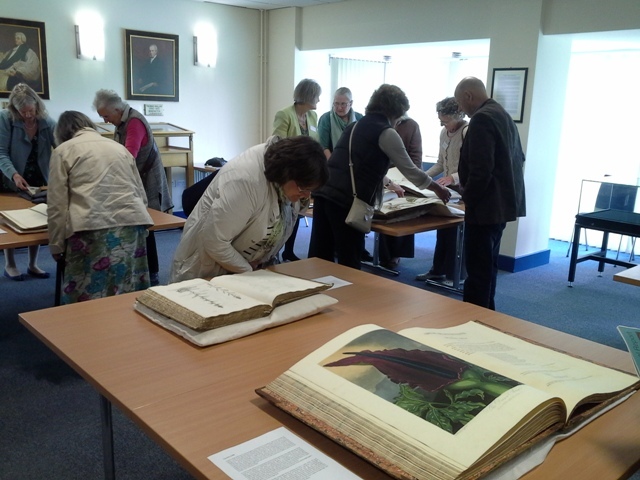 A month later I was viewing a selection of botanical volumes in the Roderic Bowen Library at Lampeter. And here, blazing out from the page of a magnificent folio sized volume published in 1799 was my newest favourite flower! The book was The Temple of Flora by Robert John Thornton a ‘coffee table’ book for the gentlemen returned from the Grand Tour of Europe. The bloom, exquisitely rendered in glowing colour, is framed against the eruption of Vesuvius for added drama. 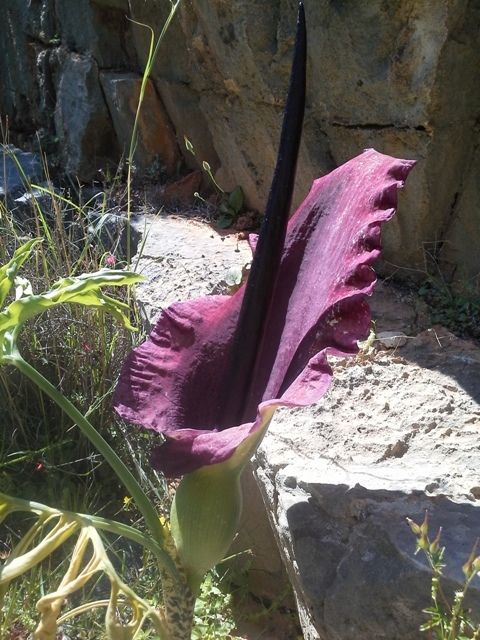 Arums are generally poisinous, but the theatrical appeal of this plant has perhaps led to some over-exaggeration. Dioscorides instead was obviously taken by the sexual connotations of the plant’s appearance for he recorded that “being drunk with wine, it stirs up the vehement desires to coniunction”. Not quite so fatal then, and we don’t really know whether the desires were fanned by the arum or the wine! I understand that Thornton’s book, in which the 28 colour plates, employing the finest artists and reprographic techniques, bankrupted him as the wealthy clients whom he expected to buy his book suffered financial setbacks through the Napoleonic wars. 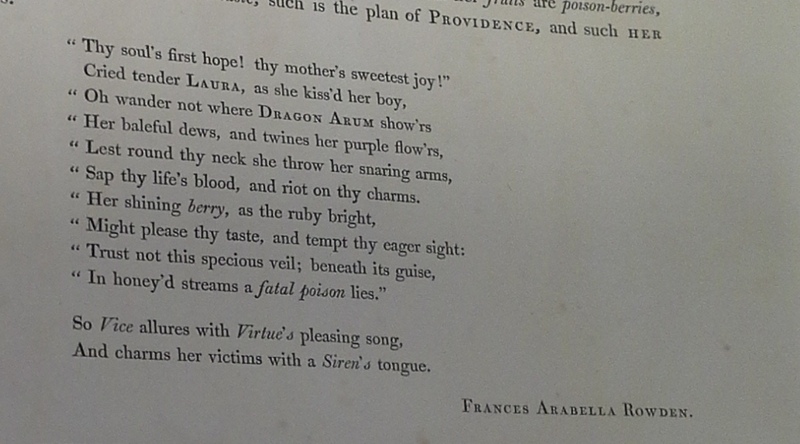 It is very tempting to imagine a copy of this book spread open in Thomas Johnes’ octagon library at Hafod, and to picture him and Jane Johnes ogling the illustrations and sending for a Dracunculus, and perhaps an insectivorous Sarracenia and a night-flowering Cereus (both also illustrated) to grow in their Nash conservatory. Johnes very possibly did have a copy of The Temple of Flora, but it would have gone up in flames in the disastrous fire of 1807, and there is no record of just what his library contained. It is thanks to the London Welshman, Thomas Phillips, East Indian Company Surgeon, that The Founder’s Library at Lampeter received a copy of this, and many other rare books in the mid 19th century.